It was supposed to be kind of an ordinary day. One where the cold has set in thick with dark shadows and temperatures can be counted by toddlers. 1-2-3. The kind where you warm up some hot chocolate and settle in with that book you've been wanting to run away in. But somehow that all changed and the house was invaded and actually taken over completely and may have even involved pulling a fairly sleepless all-nighter. I often kind of really joke that my goal is to keep the children alive until their parents return. Their parents should not trust me, honestly. Because when the kids are here we just live with a certain degree of abandon. Oh I try to be that grandma who feeds healthy snacks, real food and adheres to a good routine. It may begin all innocent, but as the hours click by, there have been times, like right now, when the rules are forgotten. So, my natural tendency is to be spontaneous, which gives way to plain old improvising and to some degree ends up too often being pure survival. I'll even imagine that I'm nearing some level of the most-awesome-Grandma-ever award and then the next moment I hope I don't damage them for life. It was like that when the baby started crying real tears, with mouth wide open, and the big boys are saying they need some help right now, (which usually means that they really do) and then I hear the swooshing sound of water hitting linoleum. At that moment it’s hard to decide which emergency is the most pressing, but I opted for the water, since there may be a precedent of water damage set by certain grand-girls. All-in-all I think it was a good call, since there were sixteen ounce cups and one tug boat full of water being dumped over the edge. –Repeatedly– It was slightly concerning that I found the two year old unharmed, but dangling from the highest ledge in the basement, but he apparently has great upper-body strength. Baby girl would beg to differ on how I set my priorities, since when she is hungry she is really starving. Perhaps we missed the window of time when children slip into quiet slumber. No kidding, one at a time every child was tucked into their little beds and a good night prayer was prayed. They each then, wanted to be the ones to pray. The one four year old prayed for everything from roads and cars and skies and dolls. Twice. And then the excuses began. These kids have earned their masters in deferring the inevitable. Forget the standard, "I'm thirsty." The one boy took my hand and asked me to sit with him. When I acted like I may be ready to leave he leaned in and told me how much he loved me and then he said, "Nana, you are beautiful." Bad or good, that boy had me. I think the little redhead may have won the prize for excuses, however. The hands on the clock were getting close to midnight and I was still convincing her that she must stay in bed and close her little blue eyes. She stated most matter-of-factually, "But Grandma, I need to trim my fingernails." As I crawled into the spare bedroom where the baby was sleeping, she began cooing the most adorable sounds, ever. This continued, off and on until about three in the morning. She ate and had conversation and a complete change of clothes and an hour later finally drifted off to sleep. Three of the kids woke up around four thinking that it was morning and I assured them it wasn't, and then crawled into my own bed where the two year old was. Moments of sleep were punctuated with kicks to the head and I remembered many such nights with his own mother doing the same. Somehow it was sweet. Light streamed in as the bedroom door opened and the hall light revealed four little silhouettes who rushed in, all chattering, "What are you still doing in bed, grandma?" We all huddled under the canopy of covers and shrieked at cold feet, tickling and some whining may have gone on before we settled into the morning with teddy-bear shaped graham crackers and milk for breakfast. This, my friends is what I think it looks like to live in the moment, with abandon and great love. I'm typing in the aftermath of that mostly sleepless all-night adventure. The dogs are making a nuisance of themselves snagging random snacks left behind. Poor Ken and Barbie are wearing each other's clothes and flashlights still glow dimly with drained batteries, under beds and wedged in couch cushions. Involuntarily I have to chuckle at their antics and the big words that flow out from their young lips. There is such a happy-messy-whirl in the time these cousins spend together. Someday when they look back, I pray that they remember how we sang silly songs, made up new rules to classic games, and that we went to bed too late, got up too early and played hide-and-go-seek in every niche in this home. I hope they recall how we laughed and cried and fussed together. And that we sat around on the floor to listen to the important profound conversations that only young children can have and that we adults need to listen closer to, with our hearts. I hope they remember kissing babies and that as they grow up they won't stop dreaming and creating and imagining. And most of all, that they will love each other always, with deep abandon. 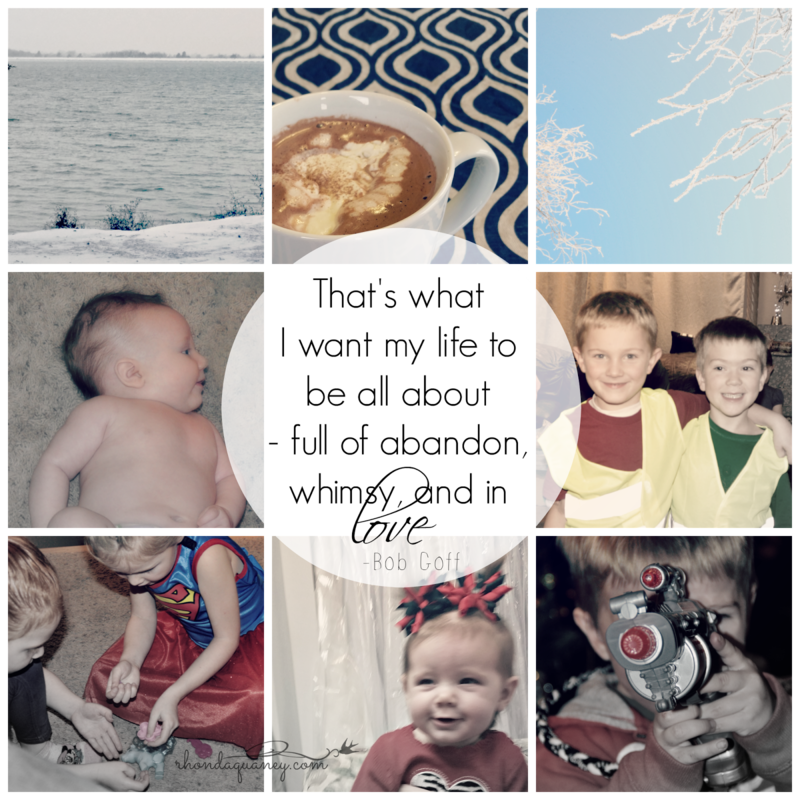 So friends, what do you think it looks like to live a life full of abandon, whimsy and love?